A recent video uploaded to Facebook by UFCW Canada depicts the owner of Best Western Seven Oaks in Regina, Saskatchewan pushing and shoving UFCW Local 1400 members who are currently on strike for a living wage, fair benefits, and back pay. The video was posted to demonstrate the bullying that the workers at the hotel have endured. Now, UFCW Canada Local 1400 is asking for support from our union family. Instead of harassing and abusing workers, they want the owner to get back to the bargaining table so they can reach a fair agreement. The workers have been on strike for nearly two months, but their employer is refusing to respect the collective bargaining process after negotiations came to a standstill back in December. 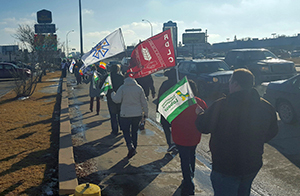 “We’re willing to sit down at the table at any time, as the members are eager to negotiate, but the company refuses to budge on several issues, and they do not seem interested in negotiating, so our fight for fairness continues,” said Norm Neault, President of UFCW Canada Local 1400. To advance the call for a fair contract, the Best Western workers and their families are asking consumers, supporters, and friends to join the campaign for fairness at Best Western Seven Oaks by sending a letter to Best Western’s President and CEO, David Kong. The strike has gained the attention of local media and has garnered support from surrounding communities. You can help show that our entire union family stands behind these hard-working brothers and sisters by sending your message, as well as by sharing the above video on social media.